Roll dice (or flip a coin) to see which player gets to choose who goes first. Whoever goes first skips the first draw step (that player doesn't get to draw a card). If you've just played a game, the loser of that game decides who goes first. Shuffle your deck. Then you draw the top seven cards. If you don't like your starting hand, you can mulligan. When you mulligan, your hand is shuffled into your library and you draw a new hand of one less card. You can do this as many times as you want, but you draw one less card each time. Once both players are satisfied with their starting hands, the game starts. Think of mana as Magic money. it's what you use to pay most costs. Lands (and some other cards) make mana, which goes into your mana pool. Your mana pool is where mana is stored until you spend it. Like money in your wallet, mana left in your mana pool will "burn a hole in your pocket". At the end of each phase, you lose 1 life for each unused mana in your mana pool, and the mana disappears. This is called mana burn. Each mana can either be one of the five Magic colors or colorless. When a cost requires colored mana, you'll see colored mana symbols. When any kind of mana can be used to pay the cost, you'll see a symbol with a number in it (like 2). Mana that you've made doesn't last forever. At the end of each step or phase of the turn, any unused mana in your mana pool disappears. This doesn't happen often because usually you'll only make mana when you need it to cast a spell or activate an ability. 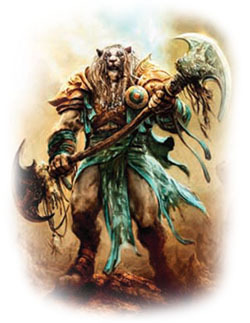 A card or creature token on the battlefield. 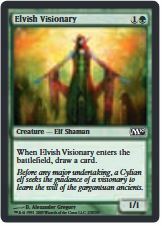 Permanents can be artifacts, creatures, enchantments or lands. Once a permanent is on the battlefield, it stays there until it's destroyed, sacrificed, or removed somehow. You can't remove a permanent from the battlefield just because you want to, even if you control it. If a permanent leaves the battlefield and then re-enters the battlefield, it's treated like a brand-new card. It doesn't "remember" anything about the last time it was on the battlefield. Unless they say otherwise, spells and abilities affect only permanents. For example, Unsummon reads, "Return target creature to its owner's hand". You must target a creature on the battlefield, not a creature card in a graveyard or anywhere else. To tap a card is to turn it sideways. 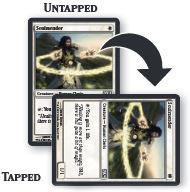 You do this when you use a land to make mana, when you attack with a creature, or when you activate an ability that has the symbol as part of its cost ( means "tap this permanent"). When a permanent is tapped, that usually means it's been used for the turn. You can't tap it again until it's been untapped (straightened out). At the beginning of each of your turns, you untap your tapped cards so you can use them again. When you see the word "target" on a spell or ability, you have to choose one or more things for the spell or ability to affect. You'll be able to choose only certain kinds of things, such as "target enchantment" or "target creature or player. You choose the targets for a spell when you cast it, and you choose targets for an activated ability when you activate it. If you can't meet the targeting requirements, you can't cast the spell or activate the activated ability. Once you choose targets, you can't change your mind later. When the spell or ability resolves, it checks the targets to make sure they're still legal (they're still there, and they match the requirements stated by the spell or ability). If a target isn't legal, the spell or ability can't affect it. If none of the targets are legal, the spell or ability is countered and does nothing at all. 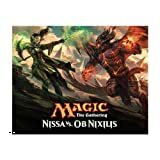 Every Magic card has one or more types. A card's type tells you when you can play the card and what happens to the card after you do. 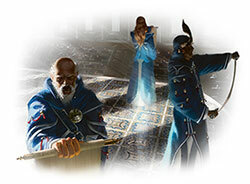 There are 6 types of Magic Cards: Artifact, Creature, Enchantment, Instant, Land and Sorcery. Click here for more information about the cart types. This is the deck of cards you use to play the game - your draw pile. It's kept face down, and the cards stay in the order they were in at the beginning of the game. No one can look at the cards in your library, but you can know how many cards are in each player's library. Each player has his or her own library. This is where cards go when you draw them, just as in most other card games. No one except you can look at the cards in your hand. During your cleanup step, if you have more than seven cards, you have to discard until you have seven. Each player has his or her own hand. You start the game with nothing on the battlefield, but this is where the action is going to be. On each of your turns, you can play a land from your hand. 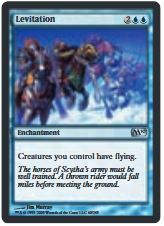 Creatures, artifacts, enchantments, and planeswalkers also enter the battlefield after they resolve. You can arrange your permanents however you want (we recommend putting lands closest to you), but your opponent must be able to see all of them and tell whether they're tapped. This zone is shared by both players. This is your discard pile. Your instant and sorcery spells go to your graveyard when they resolve. Your cards go to your graveyard when they're discarded, destroyed, sacrificed, or put there by an effect. Cards in your graveyard are always face up and anyone can look at them at any time. 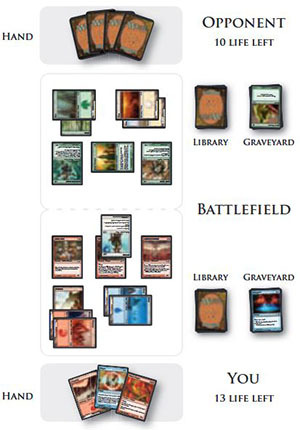 Each player has his or her own graveyard. This is where spells and abilities go after you play them. They wait there to resolve until both players are done playing stuff. Then the spells and abilities on the stack resolve from top to bottom (the last one played is on top). All players use the same stack. This is an area off to the side where your cards go when a spell or ability removes them from the game. Cards removed from the game are normally face up. This zone is shared by both players. An ability is like a spell printed on a permanent. Many abilities have costs, and you play and resolve most of them just like spells. Once you play an ability, it doesn't matter what happens to its source. If you play Crossbow Infantry's ability and then the Infantry is destroyed, the ability will resolve anyway. You play an activated ability by paying its cost. All activated abilities have a colon (":") in them. The part before the colon is the activation cost. The part after the colon is the effect you get when you pay the activation cost. For example, "Draw a card" means if you tap the permanent with the ability, you draw a card. You can usually play activated abilities with in their costs only once a turn because you can't tap a permanent if it's tapped already. You can play an activated ability without in its cost as many times as you can pay the cost. You can play an activated ability any time you could play an instant (whenever you have priority). It goes on the stack and waits to resolve just like an instant. You can only play the activated abilities of permanents you control. An ability that starts with the word "when", "whenever", or "at" is a triggered ability. You don't play a triggered ability. It just goes on the stack automatically right after its trigger event occurs. For example, Venerable Monk reads, "When Venerable Monk comes into play, you gain 2 life". The trigger event is the Monk coming into play. When that happens, the Monk's ability goes on the stack. When it resolves, you'll gain 2 life (if you were the one who played the Monk). You can't choose to ignore or delay a triggered ability. If the trigger event occurs more than once, the ability goes on the stack once for each time the trigger event occurs. You don't play and resolve static abilities like the other two ability types. When a permanent with a static ability comes into play, the ability's effect simply "turns on". It stays on as long as the permanent stays in play. (Static abilities create continuous effects). Most enchantments have static abilities. For example, Telepathy reads, "Your opponents play with their hands revealed". Once Telepathy is in play, you don't have to pay a cost to have your opponent reveal his or her hand. Your opponent's hand is just kept face up on the table until Telepathy leaves play. Now that you can make mana, you'll want to use it to cast spells. All cards except lands are cast as spells. 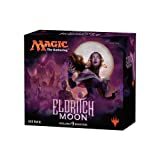 You can cast sorceries, creatures, artifacts and enchantments only during one of your main phases when there's nothing else on the stack. Instants can be cast at any time. To cast a spell, take the card you want to cast from your hand, show it to your opponent, and put it on the stack. (The stack is the game zone where spells live. It's usually in the middle of the table). There are a few choices that you need to make right now. If the spell is an instant or sorcery and says "Choose one -", you choose which of the options you're using. If the spell is an instant or sorcery and it has a target, you choose what (or who) that target is. Aura spells also target the permanents they'll enchant. If the spell has in its cost, you choose what number X stands for. Other choices will be made later, when the spell resolves. Now check what the spell's cost is. Tap your lands to produce the mana necessary to pay that cost, and pay it. Once you do that, the spell has been cast. The spell doesn't resolve (have its effect) right away - it has to wait on the stack. Each player, including you, now gets a chance to cast an instant or activate an activated ability in response. If a player does, that instant or ability goes on the stack on top of what was already waiting there. 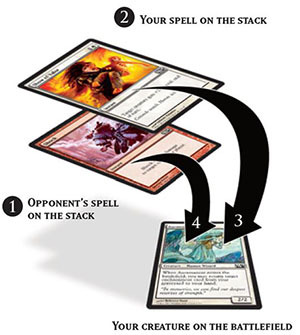 When all players decline to do anything, the top spell or ability on the stack will resolve. When a spell resolves, one of two things happens. If the spell is an instant or sorcery, it has its effect (in other words, you follow the instructions on the card), then you put the card into your graveyard. 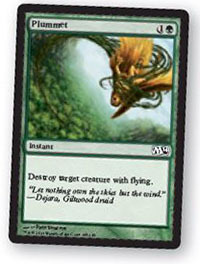 If the spell is a creature, artifact or enchantment, you put the card on the table in front of you, near your lands. The card is now on the battlefield. Any of your cards on the battlefield is called a permanent because it sticks around permanently (well, until something happens to it). 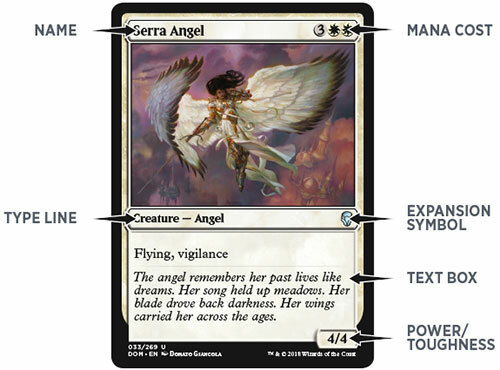 Many permanents have abilities, which is text on them that affects the game. After a spell or ability resolves, both players get the chance to play something new. If no one does, the next thing waiting on the stack will resolve (or if the stack is empty, the current part of the turn will end and the game will proceed to the next part). If either player plays something new, it goes on top of the stack and the process repeats. 1 Your opponent casts Shock targeting your Auramancer, a 2/2 creature. The Shock goes on the stack. 2 You respond to the Shock by casting Show of Valor on your Auramancer. Show of Valor goes on the stack, on top of Shock. 3 You and your opponent both decline to do anything else. Show of Valor resolves, making the Auramancer 4/6 until the end of the turn. 4 Then the Shock resolves, dealing 2 damage to the pumped-up Auramancer. That's not enough to destroy it. The stack is where spells and abilities wait to resolve after they've been played. They stay on the stack in the order they were added to it. How does it work? A player with priority plays a spell or ability, and it goes on the stack. That player can add more spells or abilities to the top of the stack or pass. If the player passes, the opponent gets priority and may add spells or abilities to the top of the stack or pass. Priority goes back and forth this way until both players pass in a row. When both players pass, the spell or ability on the top of the stack-the one played last-resolves. After each spell or ability resolves, the active player gets priority again. If an ability produces mana, it doesn't go on the stack. You get the mana immediately. Static abilities don't go on the stack. They "turn on" as soon as the permanent with the ability comes into play. When you play a land, you just put it into play. Land cards aren't spells, so they don't go on the stack. One-shot effects do something once, such as deal damage or destroy a creature. 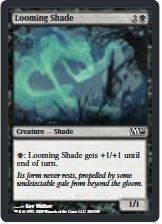 For example, Tidings reads, "Draw four cards". When it resolves, its effect is done. Continuous effects do something for some length of time. A continuous effect from a spell, an activated ability, or a triggered ability lasts as long as the effect says it does. For example, Giant Growth reads, "Target creature gets +3/+3 until end of turn". Its effect lasts from the time the spell resolves until the end of the turn. A continuous effect from a static ability lasts as long as the permanent with the static ability is in play. For example, Unholy Strength reads, "Enchanted creature gets +2/+1". Its effect on the enchanted creature lasts as long as it's attached to that creature. Replacement effects wait for something to happen and then change it some how. They "replace" one effect with a different one. A replacement effect always uses the word "instead". 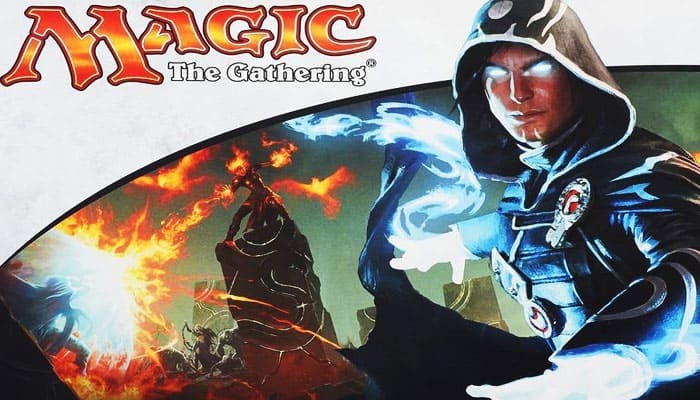 For example, Furnace of Rath reads, "If a source would deal damage to a creature or player, it deals double that damage to that creature or player instead". It waits for damage to be dealt to a creature or player, and then changes it so that twice that much damage is dealt. Prevention effects wait for something (usually damage) to happen and then keep it from happening. They always use the word "prevent". Prevention effects work like shields. Once the spell or ability that makes the effect resolves, the effect hangs around waiting for damage to be dealt. Then it stops some or all of it. For example, Holy Day reads, "Prevent all combat damage that would be dealt this turn". You can play Holy Day long before combat, and its effect will hang around for the rest of the turn. Then if creatures try to deal combat damage that turn, Holy Day prevents it. Prevention "shields" stick around until they're used up. For example, Master Healer reads, "oT: Prevent the next 4 damage that would be dealt to target creature or player this turn". The ability creates an effect that stops up to 4 damage during the turn. If 1 damage is prevented, it can still prevent 3 more. Each turn has five phases. Each phase occurs even if nothing happens during it. At the end of each phase, you take mana burn if there's mana left in your mana pool. During your untap step, untap all your tapped cards. No one can play spells or abilities during this step. Abilities that trigger at the beginning of your upkeep go on the stack. 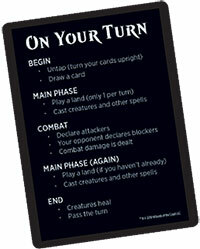 Players can play instants and activated abilities during this step. The first thing you do during your draw step is draw a card. Then players can play instants and activated abilities. You can play every type of spell and ability during this phase of your turn, but your opponent can play only instants and activated abilities. You can play a land during this phase, but remember that you can play only one land each turn. 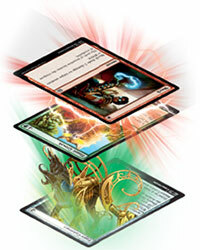 Players can play instants and activated abilities during this step, but they usually don't. You decide which of your creatures will attack. (You can decide not to attack at all). When you declare that a creature is attacking, it becomes tapped. Creatures with defender, creatures that are already tapped, and creatures you haven't controlled since the beginning of the turn can't attack. Remember that your creatures can attack only your opponent. You can't have them attack particular creatures. Once you're done declaring attackers, players can play instants and activated abilities. Your opponent decides which of his or her creatures will block your attacking creatures. Each blocking creature can block only one attacking creature, but your opponent can have two or more creatures gang up and block an attacking creature. Tapped creatures can't block. 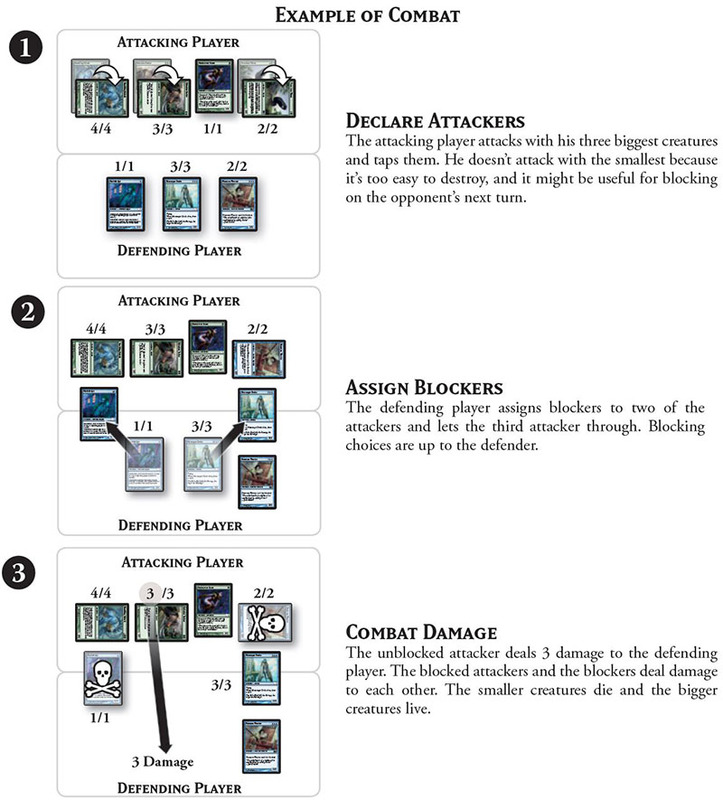 Once your opponent is done declaring blockers, players can play instants and activated abilities. This is when creatures actually deal their damage in combat. Unblocked attackers deal damage equal to their power to the defending player. Blocked attackers deal their damage to the creatures blocking them. If more than one creature blocks one of your attackers, you decide how to divide the attacker's damage among the blockers. Blockers deal their damage to the creatures they're blocking. If a creature has become tapped since it was declared as a blocker, it still deals damage normally. If an attacking creature was blocked at the declare blockers step, it doesn't deal any damage to the defending player. This is true even if all the blockers have left play. Once you decide how combat damage will be dealt, the damage goes on the stack. After that, the damage is "locked in". It will be dealt even if some of the creatures leave play. Players may then play instants and activated abilities. Once these have all resolved, combat damage is actually dealt. If a creature tries to deal damage to a creature no longer in play, it can't and the damage isn't dealt. Players can play instants and activated abilities during this step, but they usually have no reason to. Your second main phase is just like your first main phase. You can play every type of spell and ability, but your opponent can play only instants and activated abilities. Also, you can play a land during this phase if you didn't during your first main phase. Players can play instants and activated abilities during this step. If you have more than seven cards in your hand, choose and discard cards until you have only seven. Next, all damage on creatures is removed and all "until end of turn" effects end. No one can play spells or abilities during this step unless an ability triggers during the step. That rarely happens.